The Triangle Cross Ranch program for struggling teenage boys was originally designed as a long-term, 18 month residential program that has a high success rate in helping at-risk teens overcome negative behavior. 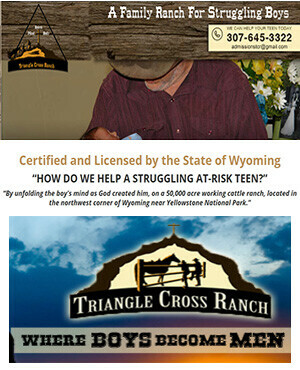 By customizing an individualized service plan to accomplish the unique goals and objectives of each child and also facilitating an academic curriculum for all the boys who are in our care, Triangle Cross Ranch is able to address and correct emotional and behavioral issues without letting our boys fall behind in school. Our trained team of youth mentors tutor the boys during our classroom hours and are committed to devoting the necessary care and attention to your child to ensure that he progresses academically. As a Catholic boys home, Triangle Cross Ranch offers a selection of “home-schooling” options that function in correspondence with accredited Catholic educational institutions such as Seton Hall or Our Lady of the Rosary, from which your child can earn a high school diploma. The alternative educational style of “home-schooling” is ideal for students that have learning disabilities, a history of disruptive classroom behavior, or are simply academic “underachievers” because it dramatically minimizes social distractions and negative peer influences that are a constant in the traditional school setting. Contrary to traditional scholastics that base the progression of education off of a 9 month academic calendar, the students in one of the home study programs used by Triangle Cross Ranch progress according to their retention of the material. The benefit of this approach is that the advanced student will not be restrained by the abilities of his classmates, which often lead to boredom and disruptive behavior; he will be able to begin new courses that will continue to stimulate his intellectual development. The struggling student, on the other hand, will receive extra assistance and instruction by our experience staff; they will work one-on-one with the student and offer tutorials to help further his educational growth. Accredited Catholic Seton Home Study Program – Accredited by the Southern Association of Colleges and Schools (SACS) which is a member of Advanced ED. These agencies are recognized as accrediting agencies by the United States Department of Education. Our Lady of the Rosary home study program – An internationally recognized and accredited Catholic correspondence school for children in grades pre-kindergarten through twelve. 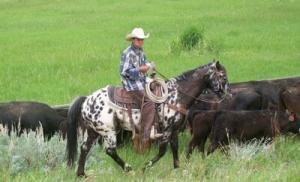 In addition to the home schooling options we offer, Triangle Cross Ranch also provides vocational/technical (vo-tech) training that teaches at-risk teens many skilled trades such as welding and metallurgy, mechanical technology, carpentry, animal husbandry, equine training, and horticulture. The skills your child will develop in our vo-tech training programs can potentially lead them into lucrative careers that will give them a sense of both enjoyment and fulfillment. At Triangle Cross Ranch, our belief in “experiential learning” enables a transformation to occur within the struggling teens that are placed in our care. We believe that by using tangible hands-on projects the student is completely immersed in an educational experience from which he can make cognitive connections and “see the bigger picture.” Some examples of how Triangle Cross Ranch draws upon experiential learning include challenging a boy who is studying geometry to keep a construction project square, or a student of biology to feel the live pulse of a bovine fetus when pregnancy testing our “Mama Cows.” Triangle Cross Ranch is in a privilege position to provide such lessons, as our farm/ranch environment has a variety of vo-tech activities that promote critical/analytical abilities and both problem solving and organizational skills. The additional benefits that are gained by living closely with nature include simplifying needs, confronting fears, honing survival instincts, and activating the romantic imagination of youth when faced with the sublime beauty of God’s creation!